Building on the success of the Absolute Station Preston Innovations have added some superb new features to make the next generation of Absolute seatboxes even better! The new design has been based around a 36mm leg system which offers unrivalled stability while also looking the part. The 36mm legs include low profile mud feet which means that you can get the box extremely low to the ground while the new design also saves weight over previous models. The Absolute has many brand new design features that make using the seatbox easy. The footplate is secured in place by spring loaded quick release pins, these can be precisely locked in the open or closed position, ensuring that your set up is ultra-stable at all times. 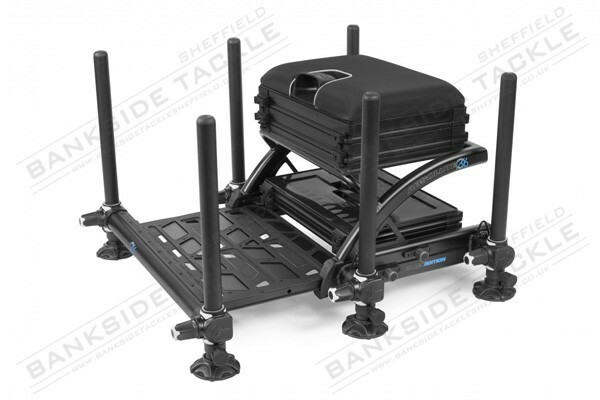 The winder tray cassette uses the same quick release locking pins which makes it quick and simple to remove at any time during your session, this is further enhanced by the unique design of the Frame which allows the cassette access to slide out of both the front and rear of the SeatBox Frame. The spirit level is located centrally on the Frame and is in the perfect place to ensure your setup is level at all times, a point that is often overlooked but vital for comfort over a long session. All of the supplied ABST units feature our brand new ‘Mag Lok’ locking clips, these revolutionary new locking clips feature a positive magnetic catch which opens and closes securely without the associated risk of wear and tear commonly found on current plastic catches. This ensures that our new “Mag Lok” locking clips will work securely and effectively time after time. Interchangeable colour tabs can be added to the trays to match the colour choice of your winder selection. Our new “Mag Lok” ABST units are fully compatible with all original Absolute Station Units and SeatBoxes. The deluxe padded seat now includes an integrated shallow side drawer; this makes better use of space under the seat and is perfect for storing winders, general accessories or hook length boxes.